Small eel-like fish. Distinguished by a row of ocellated (eye) spots (9 - 15) underneath the long dorsal fin that runs the length of its body. Orange-brown. Ocellated spots often not clearly visible in small specimens. Similar species: Common Eel Anguilla, and Eelpout Zoarces viviparus. Breeding: Winter - spring. Eggs guarded by the male fish, intertidally (north) to 25 metres depth. Habitat: Benthic, shallow seas, intertidal except summer. Worms, small crustaceans like amphipods. It was really fascinating to watch the small South-clawed Hermit Crab, Diogenes pugilator, moulting inside its shell. Alas the predatory Butterfish, Pholis gunnellus, was much too quick and it had the soft-shelled hermit crab for dinner in a fraction of a second. The Boar Fish, Capros aper, paid little heed. Butterfish show an predatory interest in the activities of hermit crabs, including the Common Hermit Crab, Pagurus bernhardus, with the ragworm Nereis fucata residing inside. All British coasts. Common in the north and only occasionally found intertidally in the extreme south-west. Very common off some Scottish coasts. Atlantic coast of North America. Sussex: frequent in spring and autumn intertidally on rocky shores. Rarely in large pools (On Sussex shores, 1 in a 1000+ only). Northern fish so unable to tolerate living on the shore during the summer, where it is common under stones in the spring and autumn. Often infected with the Black-spot disease Cryptocotyle lingua. Eaten by otters off Scottish coast. Mucus covered scale-less body is very slippery, hence its common name. Impossible to grab hold of by the inexperienced. Butterfish, Pholis gunnellus, infected with the Black-spot parasite Cryptocotyle lingua. Life style of the trigenetic parasite Cryptocotyle lingua. Some books misidentify this fish as the Eelpout Zoarces viviparus. October 1999. Butterfish located in Loch Creran, Argyll, Scotland. (56° 31' N, 5° 23'W). Prevalent. Identified using various text and advice of a senior lecturer. Peter R Haylock, Heriot-Watt University. April 2000: under Selsey Lifeboat Station, West Sussex coast (Paul Parsons). Clay bedrock with loose rocks. Frequently discovered at Kingston Beach, Shoreham-by-Sea, spring and autumn. Rarely (1 in a 1000) in pools. Neil Watkins discovered these fish on Auchmithie beach in Angus, Scotland. They range in size from about 6 cm to approx 15 cm. I spotted several Butterfish at St Abbs (shore dive heading for Cathedral rock), SE Scotland on the 21st Sept 2002. Simon Mardle. I had a sighting of a Butterfish whilst scuba diving on a wreck in Scapa flow in the Orkney Islands in October 2002. I thought I should write to report the capture of a butterfish in the Holes bay area of Poole harbour, Dorset. 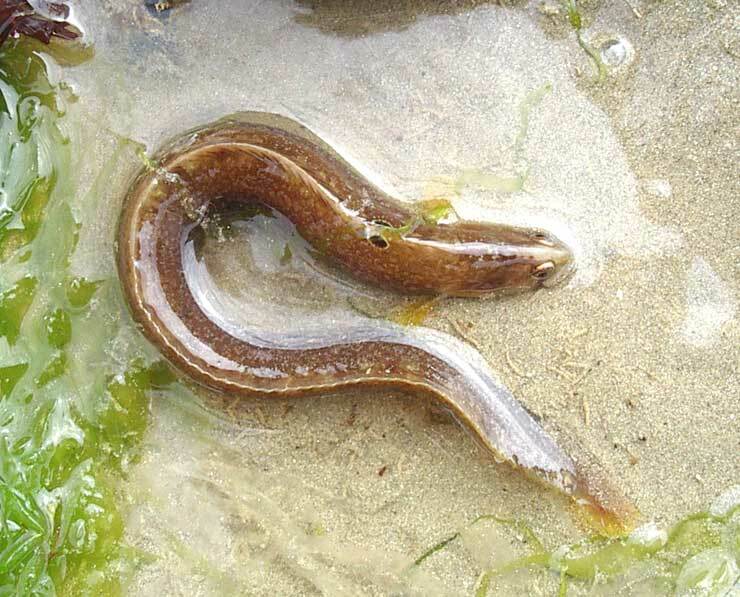 A friend ,while netting prawns along the quay wall, caught this very attractive small eel. After identifying it from a book, he brought it to me for my marine aquarium where it is now residing together with a wrasse and some blennies. During the search for more information on this species I came across your website. Me and my Dad found a butterfish in a rock pool in Gardenstown Beach in the Moray Firth, Scotland. At first we thought it was a baby moray eel when we studied it in the net we had caught it in, but later identified it as a Butterfish once we referred to your website. 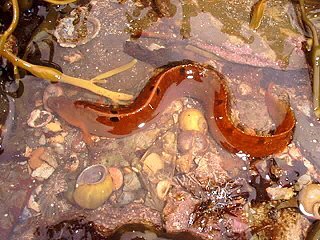 For some time now (the past three years) I have been occasionally spotting this uncommon eel where I work. I usually find it inside of clusters of seaweed I have to pull out of the water. I have taken photos of it in order to show it around to try and have someone identify it for me. To no avail. Then, just by sheer accident, I saw it's picture on your website. It's a Rock Gunnel. Finally, mystery solved. Thank you. Tom Lewis, Dockmaster / Club Steward, Ipswich Bay Yacht Club, Ipswich, Massachusetts, U.S.A.